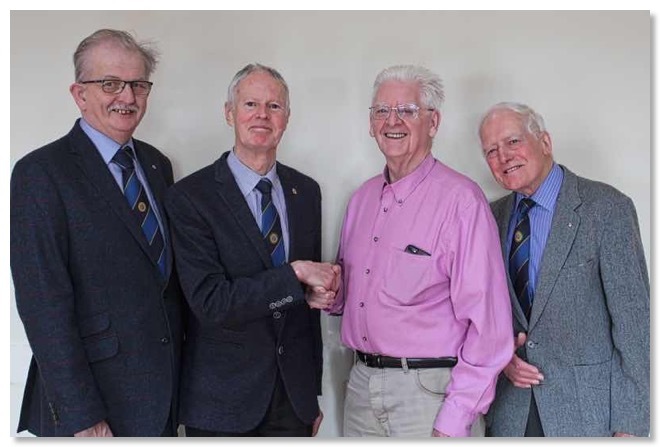 Guest speaker Barry Williams, at a recent Probus club meeting, gave members an interesting account of a little luxury we tend to take for granted - reading our local newspaper; catching up with what's happening in the town and who is making the news. If however, you only have limited (or no) vision, then you can be excluded from the town and what is happening all around you. That is just where the 'Talking News' comes in, providing a 'lifeline' to many people in our area, and across the province. The idea of 'Talking Newspapers' started in the late 1960’s in Sweden. In 1977 Derek Longhurst assisted by Mary Riddle and Mary Mullan, inspired by the Swedish idea, set up the 'Coleraine Talking News'. 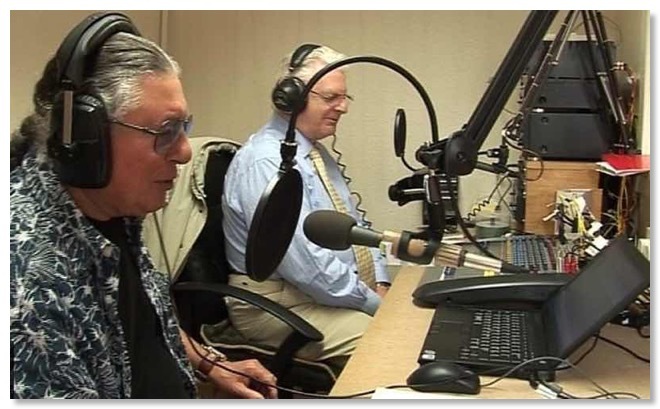 Barry took over as co-ordinator for our local Talking News team in 2009, when encouraged to do so by the late Peter Craddock. 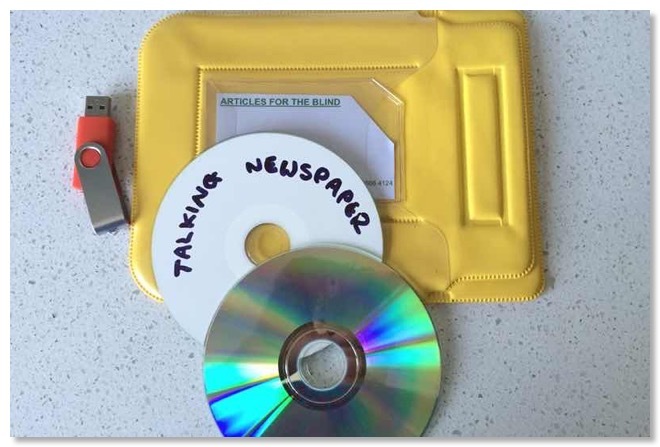 This free, weekly local news and magazine programme on CD, is aimed at making our local news accessible for people who find it difficult to read the local newspaper. This covers people with sight problems and also Parkinson's sufferers. The magazine part of the CD is recorded every Monday and the news content is recorded on Wednesday, The master CD is sent to Libraries NI in Ballymena where it is duplicated and posted, free of charge by Royal Mail, to an audience of about 200 people in the Causeway area. A special delivery, posted out 50 times a year. A lot of news and a lot of talk! In producing the CD, the advice of listeners is regularly sought, and often ghost stories top the list, with 'something to laugh at' always a popular item. Coleraine and District Talking News is one of about twenty Talking Newspapers in Northern Ireland. The main financial support for many years came from the Lions Club right up until that organisation closed. Since then, support has been received from our local Council and The Honourable The Irish Society, as well as much-needed donations from private individuals and groups. Talking News could not continue without the loyal support of all the volunteers that help in sorting and recording the content, 50 weeks of the year, a huge task in itself. Nor could the service continue without the help of our local newspapers, the Libraries Service and the Post Office, all giving a vital, and free, helping hand to Talking News. Barry confirmed that the Coleraine Group are always keen to encourage volunteers and anyone interested in this type of service should contact him at The Blind Centre in Abbey Street. And if you are reading this item in your favourite local newspaper, and in the comfort of your own home, why not think about doing just that, at the Talking News? To find out more about all the Talking News groups in Northern Ireland, 'Click' on the logo below (this will open in a new window). The History of Talking News in the Causeway area for 40+ years, and still going strong. In 1977 a group of enthusiastic new volunteers gathered in the local library to set up the Coleraine and District Talking News. They engaged the support of the University of Ulster to supply technical expertise and hardware and the NEELB (North Easter Education and Library Board) Library service to manage the growing database of users and to copy and post the tape each week. The Royal Mail provided a free delivery and return service through its Articles for the Blind scheme. Space for a studio was provided in Portrush by the Milliken family. It was soon 'all systems go'! The volunteers built up skills — editing the content of the weekly newspaper to fit the time available on the cassette tape, clear and engaging microphone skills, technical know-how for a good quality recording, and outreach into the community to new and existing listeners. As confidence grew so did the range of content on the weekly tape. Soon there was a quiz, interviews with local people, a thought for the week, stories, poems and much more. In the 1980s, we moved to our current premises in the Blind Centre in Abbey Street where we built a new studio and faced the fact that, worldwide, the cassette tape was being replaced by digital technology. "Going digital" would give our listeners better sound quality, but it also meant changing the equipment in our studio and making sure every one of our users had a CD player. Funds were raised and our volunteers swung into action to deliver CD players to everyone who needed one. Our current 80 minute CD contains news items taken from our local newspapers, music, historical, gardening tips, humorous and other items. Our studio facilities in Abbey Street are invaluable in enabling us to fulfil our aim week in, week out, producing a CD which we feel is informative and entertaining, with high production values. Over the 40 years so far, Coleraine Talking News has provided a much-valued service to our users, bringing local news and friendly voices into people's homes. New volunteers have joined us, old hands have hung up their headphones, technology has improved, but the main aim has stayed the same: to enable people who cannot read the local paper to keep up to date with local news and to stay engaged in their community.